Hi there!! I hope you all had a great weekend - especially all of you mothers out there. I cut out early last week to spend a long weekend with my family. My brother and I crashed my parents 39th wedding anniversary dinner, we had a family movie night at home, and I made a big Sunday dinner for mom and the rest of the family. I'll share more about what I made in an upcoming post... So good! 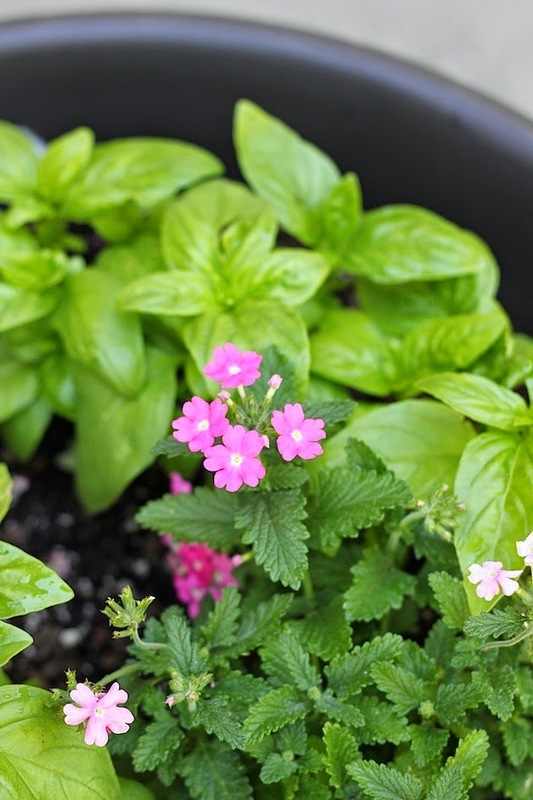 So if you are thinking about planting your first herb garden, here are a few tips on how to get started - based on what I've learned thus far, and how I planted my herb garden. They grow well in tall planters that have drain the water and allows enough room for the roots. I bought an 18 in. planter similar to this one that was round enough and tall enough to accommodate the plants I bought. 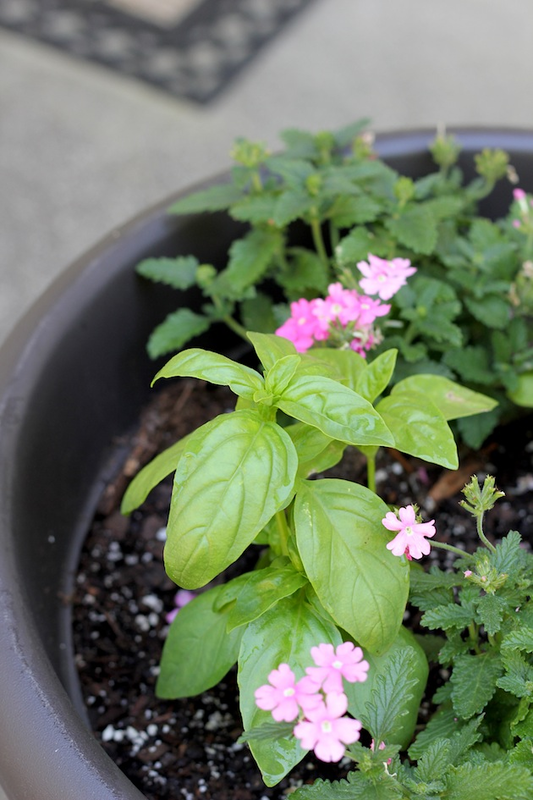 Basil needs to be in soil that is well-drained, so the planter has holes in the bottom of it that allow the excess water to drain out. I bought a plant stand similar to this one to sit the pot on so the water could drain out. I put it on the part of my patio where it gets ample sun throughout the day. I bought 3 organic basil plants (about $3/plant from Whole Foods), so I bought some good organic planting soil to plant it in. It was the nursery's own organic brand (similar here), which was about $10 for a very large bag. I filled the planter about 3/4s of the way up with the soil and planted the herbs about 8 inches apart. 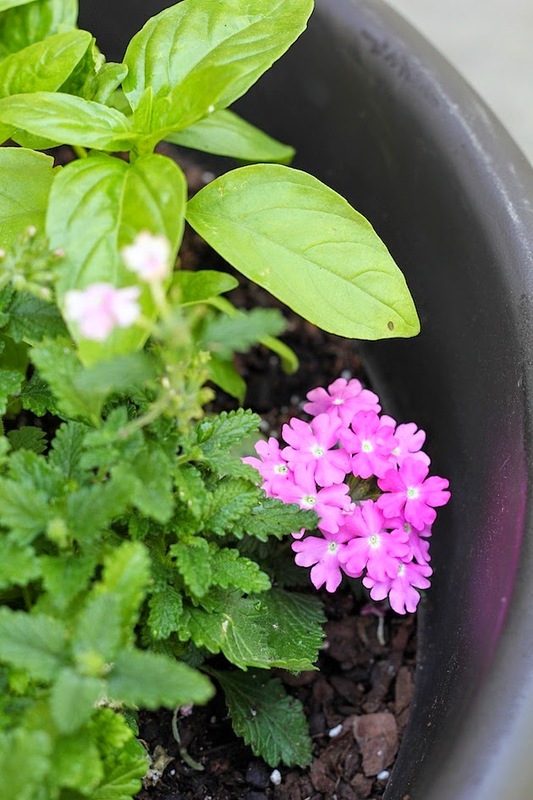 For a little color, and the chance to get a little more experience with plants, I added two Verbena's to the pot. Per my consultation with a lovely lady at the nursery when I bought my soil, Verbena's require about the same about of care as basil. They love sun, need daily watering, and like well-drained soil. I "deadhead" them (just learned that term! ), which means I pinch off any dead flowers. That allows for fresh blooms. So that's it! So far, so good! I can't wait to start pruning the basil (which I learned how to do from a YouTube video), in a few weeks to prevent early flowering. 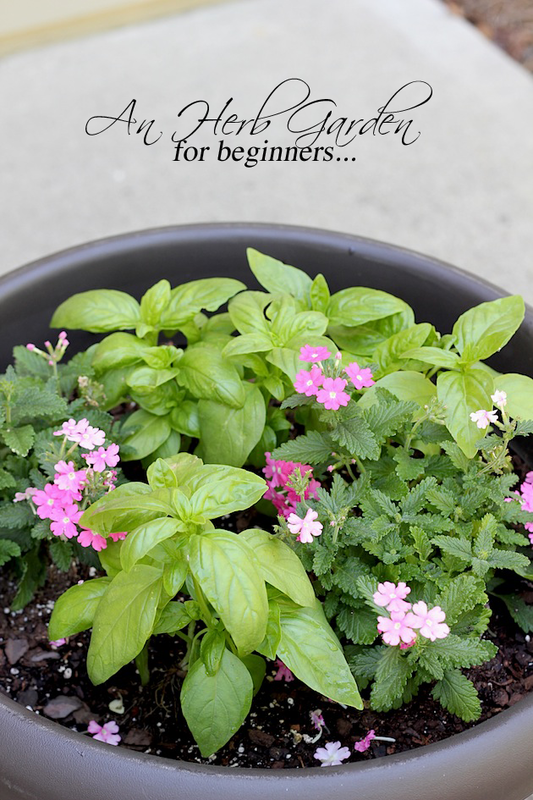 Hope this helps you if you are thinking about starting your own herb garden! So pretty. We just planted our garden a week ago. In this crazy heat it is needing a lot of watering. These look so pretty! Love having a fresh herb garden at home.